Nature has a way of marking the passage of time. One look at the colour of the fields down in the valley will indicate what season it is. And looking at the phase of the moon will tell you about time’s progress through the lunar cycle. We have discovered another indicator on an even smaller timescale. After the bushfires of ’09 and the dramatic failure of our new fire pump, we placed at the corners of our house wheelie bins of water and mops (it is amazing the extent of fire-fighting one can achieve with a wet mop and a bit of adrenalin!). The wheelie bins are positioned to catch the rain runoff from the roof that misses the guttering. During winter the bins slowly fill up so that when summer hits they are full of water. 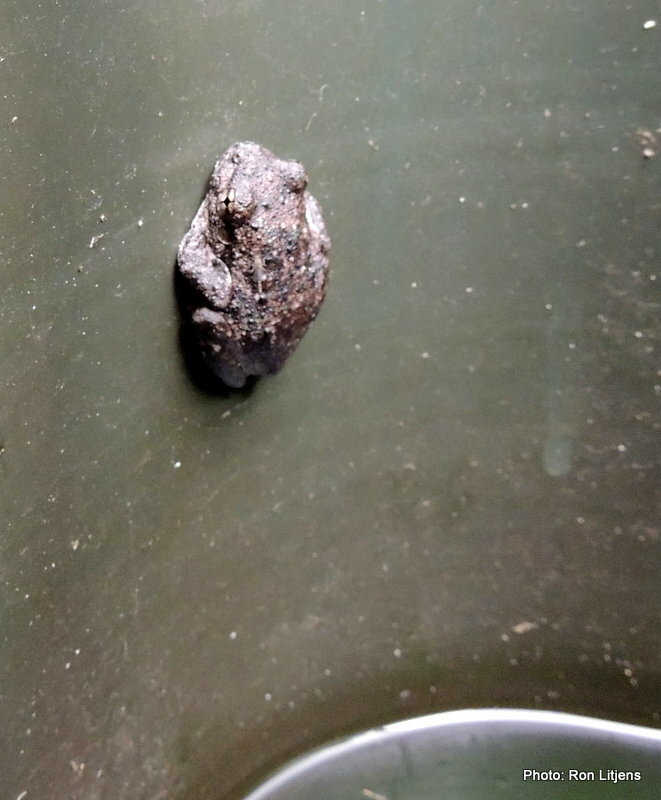 In summer, apart from the birdbath, the wheelie bin is the only water source for a considerable distance and inevitably attracts a resident frog. 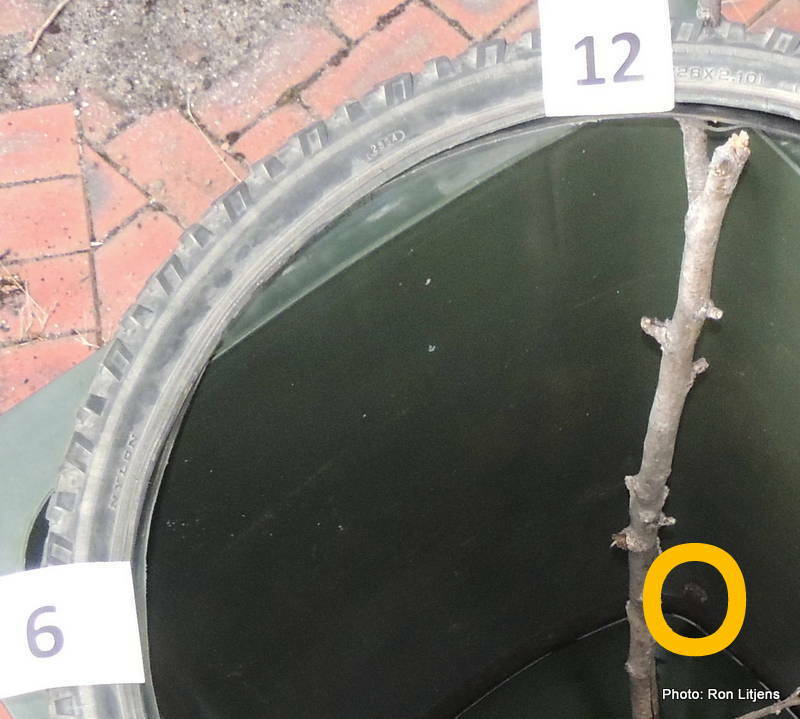 During the day the frog (circled) clings to the side of the bin (see picture left) and as the sun changes its position in the sky, the frog changes its position in the bin, staying just out of the direct sunlight. If you place a rough scale on this, in this case an old bicycle tyre with numbers on it, the position of the frog compared to the scale will give you a relatively accurate estimate of the time of day, sort of like a sundial. It works on sunny and overcast days. 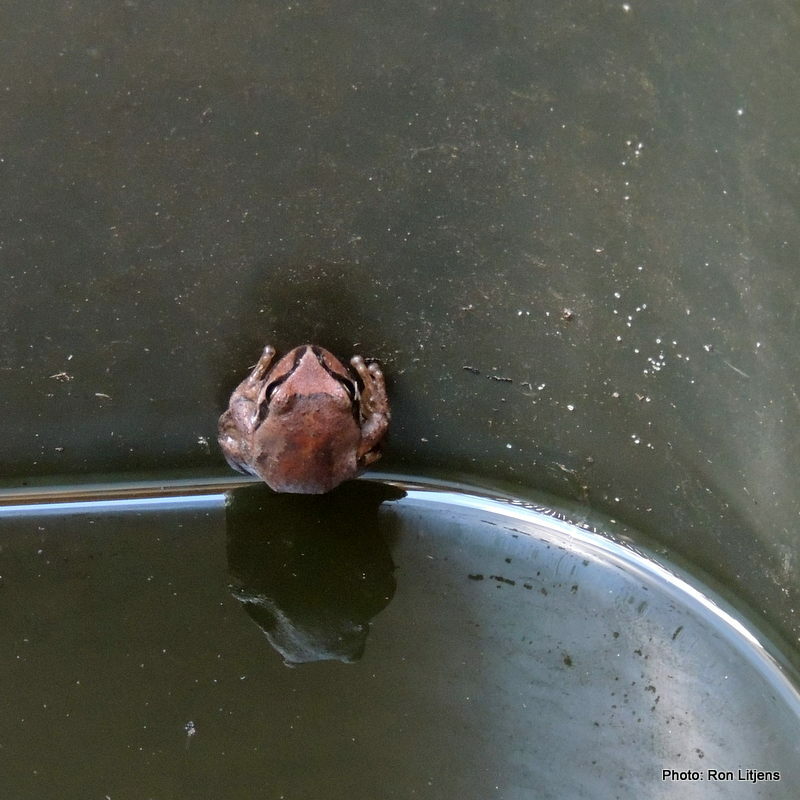 Last year the time keeper was a Plains Brown Tree Frog (Litoria paraewingii) I think, pictured above. This year a Peron’s Tree Frog (Litoria peronii) has taken up the duties. Peron’s Tree Frogs have cross-shaped pupils (see picture left). It is not as accurate as a digital watch but it is an energy-efficient biological clock – and it isn’t ticking.